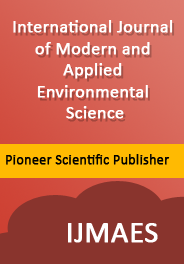 The International Journal of Modern and Applied Environmental Science (hereafter IJMAES) is a peer-reviewed international academic journal devoted to publication of high quality original pioneering research papers and critical survey/expository articles in different areas of current interest in the field of Environmental Science such as environmental chemistry, environmental biology, ecology Geosciences and environmental physics. Appropriate subjects include basic and applied research on atmospheric, terrestrial and aquatic environments pollution control and abatement technology, conservation of natural resources, environmental health study and toxicology, environmental quality assessment, environmental standards and criteria. The prominent aim of the journal is to provide a common forum to publish their significant research works in different areas of environmental science covering all branches and aspects of on both theoretical and applied aspect of current interest of environmental science and to provide academicians and researchers high quality research work incessantly and pertinently. Frequency: The IJMAES currently publishes in two volumes annually appearing in April and October.